These Glass working lathes are Precision made and of versatile design, targeted for demanding applications like joining electrodes, producing bulbs of quartz, for glass metal seals and many more. The machine bed is stress relieved and all components are hardened and ground to make it durable, wear-resistant and long lasting. Hardened and ground and therefore wear-resistant dual round bar guide in combination with the throughout machined base, stress relieved. Closed Stainless steel cover above bed for optimal protection against heat, radiation and dust. Spindle drive by service free electro drive via potentiometer steplessly variable. Power transfer to working spindles via easily adjustable precision roller or double roller chains. Revolving directions of spindles changeable by means of selector switch. 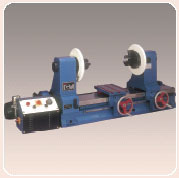 Working spindle of the tailstock, can be declutched by means of a mechanical clutch. For headstock this clutch is available as option. Working spindles have plane flange on both sides to accept chucks on the outer flange as well. Machine is equipped with an electromagnetic brake for immediate stand still and is blocked for easy opening and closing of the scroll-chucks. The brake releases automatically when the machine is started again. Steplessly variable D.C motor for connection to 110/230 V, AC single phase, 50 cycles.